What makes the KidKraft Princess Toddler Bed so great? 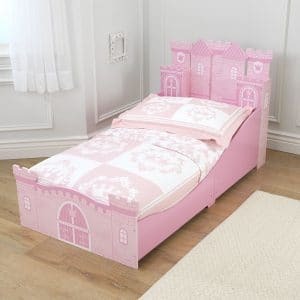 This is one of the most popular products in KidKraft’s range and it’s almost certainly a bed targeted at little girls. Given the bright and attractive colors of this product, it’s pretty easy to understand why the KidKraft Princess Toddler Bed is so appealing to little ones. Aside from design, it also offers a number of features that comprise for one of the best options on the market when it comes to princess beds. We’ve put this bed through its paces and compiled a full review of the bed. What’s more, we’ve also selected this KidKraft princess castle toddler bed to compare the product with, another popular product in KidKraft’s range. 2. What makes the KidKraft princess toddler bed so great? We’ve certainly sung the praises of this KidKraft princess toddler bed in our opening paragraphs about the product, but what makes it so great? In our opinion, the biggest feature is the bed’s design. It looks perfect in pink and great for a little princess. We also particularly love how the bed features four corner posts like a traditional bed would do. All in all, this is a bed that looks like it belongs in a castle and we can certainly vouch for that. As we’ve already mentioned, this kid’s bed is painted in pretty pink, which looks absolutely fantastic. That being said, we’re particularly pleased to see that KidKraft have used only non-toxic paint in the production of this bed. It’s important that furniture coming into contact with children is completely safe and it’s great to see KidKraft understand this. Speaking of safety, the product is also designed with a number of safety features in mind, including high rails to prevent your child from falling out of bed during the night. Another feature we look about this product is the fact that it’s completely compatible with your standard crib mattress. The best thing about this is that if you already own a crib with a mattress, you’ll be able to take the mattress out of that crib and use it in your new KidKraft princess toddler bed. A: No.A standard crib mattress will fit. Q: Is the shipping package big? Q: What’s the dimension of it? and what’s the weight? A: It’s 56 x 29.25 x 43.25 inches.It’s 50.4 pounds. Q: What is the bed made out of? A: Wood and particle board. As mentioned in the opening paragraphs of this review, we also feel that it’s important to compare the bed with other similar products on the market. We’ve found that the KidKraft Princess Castle Toddler Bed 76260 provides a similar experience to the main product, but with a few subtle changes. Taking a look at the beds, the biggest change you’ve likely noticed is that the first bed uses pillars to bring out the medieval effect. We believe that these pillars really add to the aesthetic of the product and it’s a shame to see them missing here. That being said, we did particularly like the enhanced artwork displayed on this product, it goes a lot further than the other product. Which one you choose largely depends on how much you have to spend on a kid’s bed and what you need from it. In conclusion, the design of this KidKraft princess toddler bed is really what sells the product and we absolutely love it for that. This bed truly looks like it has been designed to fit into the general aesthetic of a medieval castle. In comparison to KidKraft’s other similar product of this nature, both beds are generally pretty similar. However, we’d still choose this option over the other one because it is slightly cheaper and features those fantastic corner posts. This coupled with a range of great safety features, your little princess is guaranteed to love this bed.